Nina Freudenheim Gallery is pleased to announce a solo exhibition of black and white silver gelatin prints by Amanda Means. 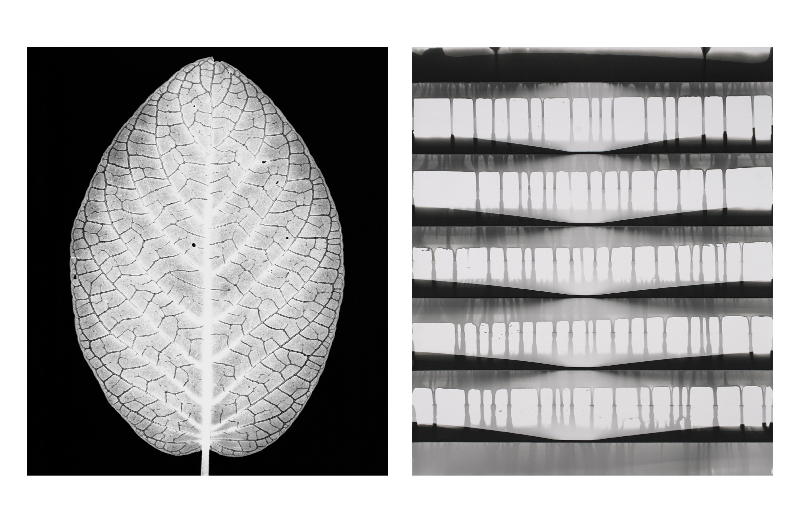 Featured will be works from her two ongoing bodies of work, "Leaves" and "Abstractions." These camera-less photographs are studies in macrocosm and microcosm, repetition in nature, and the formal qualities of the organic. Means is concerned with the rhythms and forces of nature. “These are the forces that in early spring push a leaf and all of its intricate parts out of a branch, and cause rivulets of melting snow to flow down a rocky streambed,” she states. In both the “Leaves” and “Abstractions,” this organic energy is brought into intimate view. Her celebration of the beauty and infinite subtlety of her subjects is informed by her experience as a skilled master printer, having worked for Robert Mappelthorpe and Berenice Abbott. This experience has imparted a deep understanding of how light sensitive materials can express infinitely nuanced grey tones: delicate, subtle, shifting. Above: "Silver Nerve 1990" and "Fan Abstraction 80, 2014," Silver Gelatin Prints. Copyright © 2015 Amanda Means, All rights reserved. This is so impressive. Thank you for sharing the artwork!